DAY 34 – What’s next for Bolivia’s farmers? This APQUISA quinoa is cleaned, packed and ready to go. But there’s a delay as markets and revenue streams are verified. Across the countryside, I am finding farmers who are saving hundreds of pounds of carefully planted, harvested and hand processed quinoa in their homes. Each 25-pound (quintal) bag represents almost $114 (800Bs) of labor and agricultural inputs such organic fertilizer and pest control systems but is currently valued at just $71(500Bs) or much less if it’s not organically certified ($50 or 350Bs). 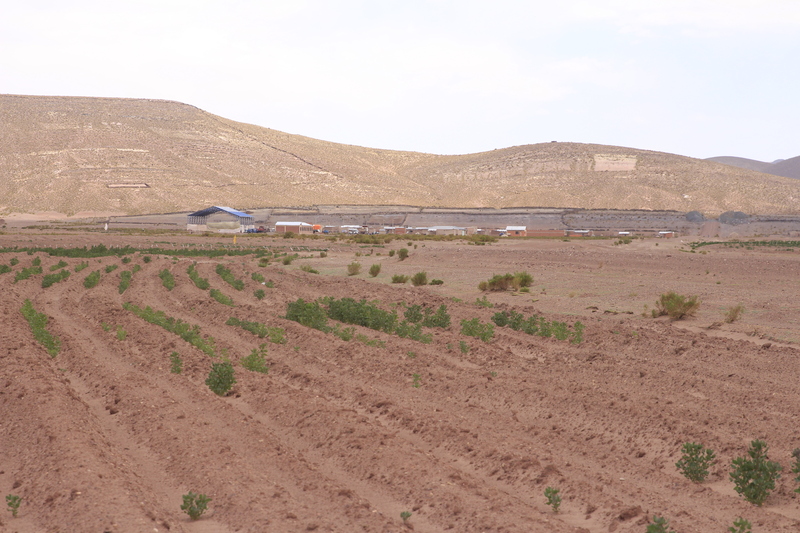 Quinoa fields – only some plants are germinating due to teh spring’s extreme drought conditions. flow. According to Ing. Aroni, is estimated there were 2,000 tractors purchased in the Royal Quinoa region over the past decade. Now it seems at least 30% have been sold or are for sale – most to the richer, more developed Santa Cruz lowlands where vast amounts of rice, wheat and soy are grown. 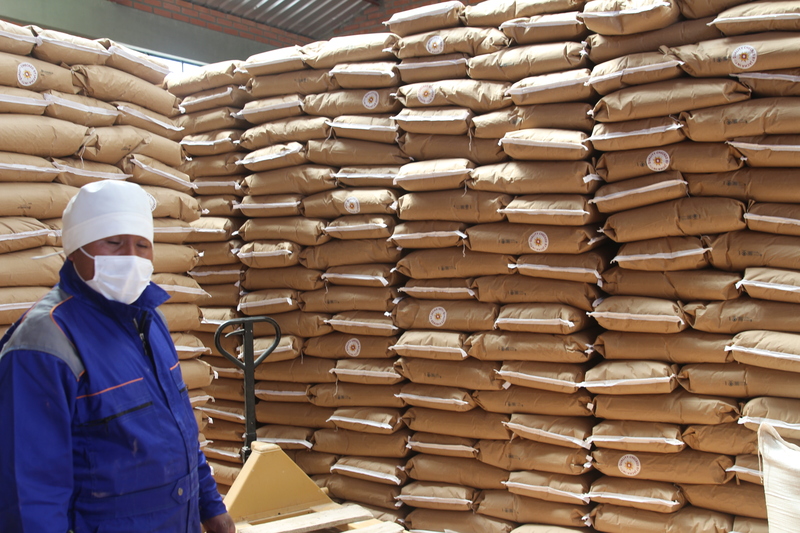 When necessary, farmers will take a few quinoa sacks to the local Challapata market to sell, below production costs, to at least keep the cash flow moving. Many of the quinoa tractors were bought from new bank loans made in the past 2 years. It will be interesting to see what happens when this year’s harvest comes through low and without much market value and there are not enough funds for loan repayments. Banks are not allowed to take farmers’ lands or houses and the production was the collateral for many of the loans which seem to average about $5,000 with a 12% or more apy. 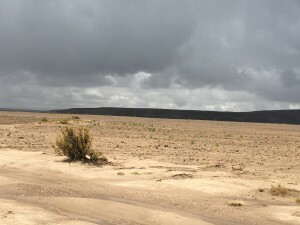 Empty fields in Bolivia’s Royal Quinoa zone. Many farmers saw the stagnant, low prices for quinoa on the world market and decided to not even bother planting quinoa. They explain that it would have been a loss for them anyway. There is vast migration which has affected education systems since fewer children are in local schools. 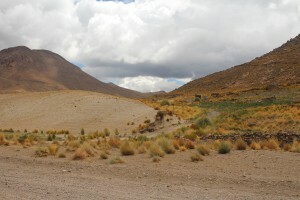 It is common for quinoa communities to have an average of 25 permanent families and 75 residents, who live in other cities and border countries such as Chile, occasionally returning to tend to their quinoa, village meeting or festivals. The local economy is also affected as there is now less construction of new houses, purchasing of farm equipment, food, labor and housing. So people have less to spend, earn less and times are tough. 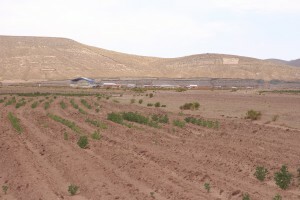 Some men have left their quinoa fields for work elsewhere – working as long distance truck drivers or as laborers in the city – leaving the women to tend to the quinoa alone with their children. Others have sent their children to college and are waiting for their children to get more professional jobs as lawyers, agronomists, and business developers – though jobs for college graduates are hard to find here in Bolivia. Entire families have left for the cities of Oruro, La Paz, Cochabamba and Santa Cruz. The desert dust bowl of some of Bolivia’s best quinoa lands. While Bolivia’s quinoa yields for 2017 look bleak, most agree that market prices will stay steady – partly due to the vast amounts of quinoa still in storage, and not in circulation in Bolivia’s quinoa market, and the continued presence of global quinoa production.